Editable Pivot Tables for Excel allows cells within an Excel pivot table to be edited directly making them a useful tool for data entry. It is often frustrating that Microsoft Excel misses the ability to edit pivot tables. With standard Microsoft Excel, you can either change the tabular information without seeing a general picture or conveniently review reports in a pivot table without the ability to change anything directly. 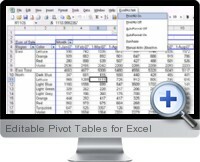 Editable Pivot Tables for Excel is an Excel add-in that corrects this problem to make Excel pivot tables editable. This turns a pivot table into a powerful tool for planning, making calculations and a data entry tasks.